Brian Viloria retained his World Boxing Organization flyweight crown after stopping Giovani Segura via technical knockout just 29 seconds into the eighth round earlier today, Sunday, December 11, 2011 at the Ynares Sports Center in Pasig City. 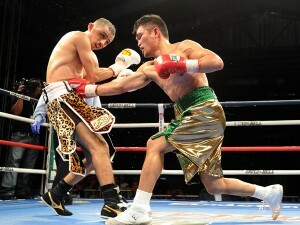 Brian Viloria found a deadly weapon in his left hook. A crushing left hook from Viloria landed on Segura’s severely swollen right temple, causing the Mexican to careen out of control and the referee had to stop the fight. It was the fourth straight triumph of Viloria, who remained in tip-top shape after a six-month break, as he upped his record to 29-3-0 with 17 knockouts. The 31-year-old Fil-American shook off opening-round jitters as he controlled the 29-year-old Mexican from the second round with his vicious left hooks and solid shots to the body. Viloria continued to dominate and in the seventh round, a stoppage was inevitable as the Hawaiian Punch pounced on a lump in Segura’s temple that swelled up to his forehead in a gruesome sight. Viloria, though, had his fair share of bruises as he suffered a cut in his left eye in the earlier round.